The first project within the practising product designer module was the Breffo live project. We worked in teams for the majority of the project, until the end where we worked solo to refine and develop a final solution. We began by learning about user testing within product design, where Bethan Gordon discussed with us the intricacies of user testing, from why it is important, recruiting the participants, methods for testing, how to record the data and finally how to analyse the data we recorded. We were then introduced to Breffo – a company that creates mobile phone accessories, mainly the spider podium which is an 8 legged phone holder for use in a variety of situations, most notable of which was on vehicle dashboards. 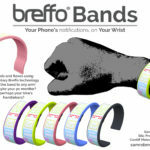 Breffo introduced the brief, which was to design a new mobile phone accessory following the Breffo brand. The main constraint was the fact that the project had to be researched and designed in a 12 hour design challenge. 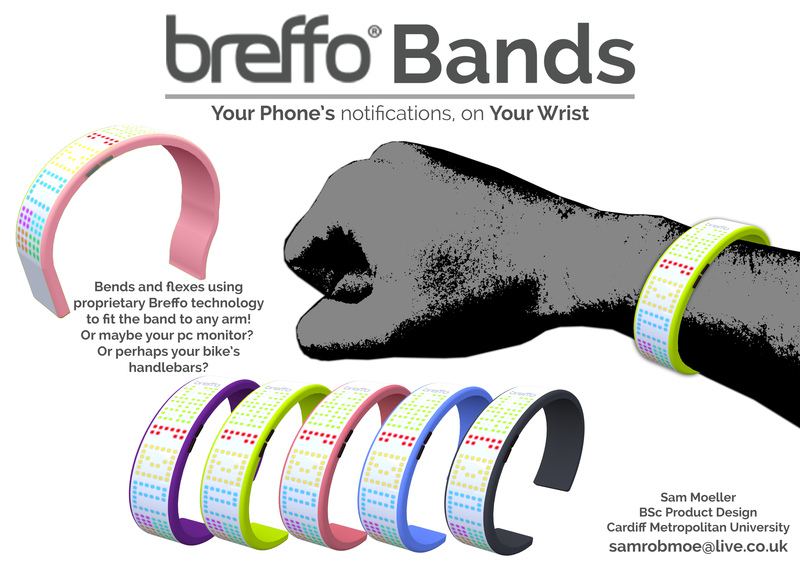 Our initial starting point was the idea of utilizing more technology within our project, to create something innovative within the Breffo brand. We undertook some initial research into the market and found that smart wearable devices were becoming very popular, which began our interest in the new technology. Breffo was quite a simple company when it came to their implementation of technology in their products and so we did not want to go too far and create an ultra technical product that wouldn’t fit their style. Our main influence was ease of use, for a wearable that users could attain information from with a short glance. We were inspired by the Nike+ FuelBand, which was a fitness centric wearable device. THe Nike band used a simple led dot matrix display which seemed a lot less complicated than any kind of screen. 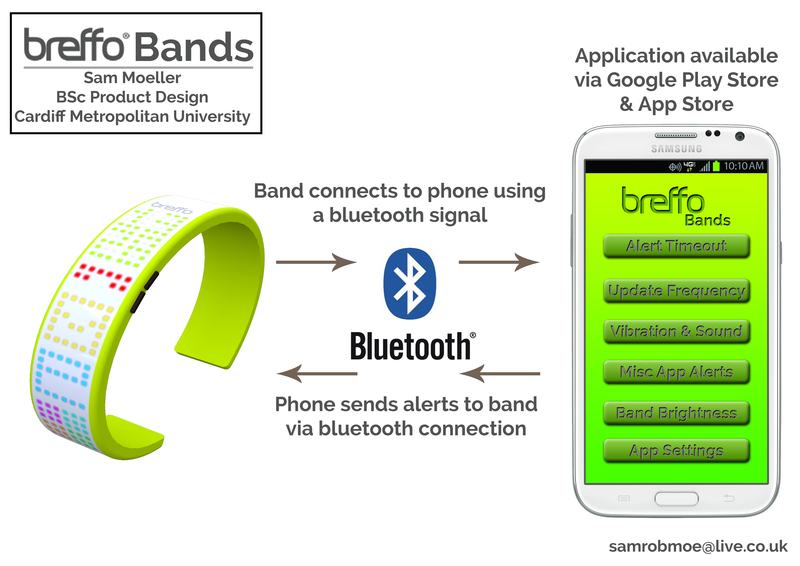 We finally decided upon creating a wearable, mobile phone companion device, which would display alerts to the user if they had an incoming call or missed call, a message or an optional social media notification. 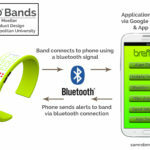 The device was made of silicone which formed a simple band shape, with the led displays underneath a thinned section of the band so that they could be seen when on, but hidden when off. The Breffo project was an excellent project to start off the term. It’s unique timescale meant that it put us under pressure as designers to co-operate within a team effectively and create a suitable design solution within a very limited time frame. I feel that the Breffo projects benefitted me greatly as it was good fun trying to think quickly on my feet. The technological standpoint was also interesting to me and the focus on mobile phone technologies was a unique change to some of the work I had undertaken previously.